POODLES are among the most intelligent dogs you can own. Originally from Germany, they were used as hunting dogs because of their sharp minds and quick responses. Poodles do not shed and are hypoallergenic. People who have allergies to dogs and cats can usually own a poodles without difficulty. Because poodles have no body dander, fur or odor, they are perfect gentlemen and ladies in your home. Mild mannered, yet protective, they are great family watchdogs, yet wonderful with children. Poodles come in three sizes: Standard Poodles, Miniature Poodles and Toy Poodles; no other breeds were used to obtain these specific sizes. They come in a variety of colors:?Cream, White, Black, Brown, Silver, Blue, Apricot, Red and Silver Beige - as well as occasional Parti's (mix of two colors) and Phantoms. 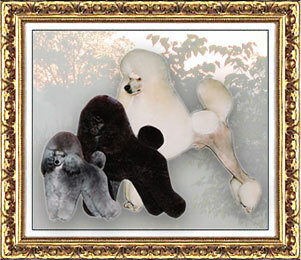 In order to be in the conformation show ring, poodles must be one color. Sorry, we do not have parti colors. Being a conscientious breeder means breeding to continually improve quality of the dogs, not for financial gain. The study of genetics is very important in selecting breeding dogs. Knowing the backgrounds of the bloodlines in your dog's pedigree is essential in order to do as much as possible to prevent genetic disorders, such as such as hip dysplasia. Keep this in mind when acquiring a puppy, for only a healthy companion, full of vitality, can give you many years of shared happiness. Please: NEVER get a puppy from places such as a pet store, puppy mill or backyard breeder. A puppy mill is where dogs are bred only for financial gain, without concern for their health and the conditions in which they are raised. The genetic health and temperament do not matter, as long as the pups can be sold for cash. If you buy from a pet store, you are only getting a puppy, secondhand, from a puppy mill. In most cases, a broker for an out-of-state puppy mill sends the pups to the pet store. These brokers acquire the pups long before they should be taken from their mothers. Normally, no shots are given and these animals are prime candidates for serious canine diseases, such as parvo and distemper. Well-intentioned people may sometimes buy from puppy mills or pet stores because they feel so sorry for the puppy. Please don't. All this purchase does is allow these terrible practices and unhealthy environments to continue, and it contributes to the profit these unscrupulous people make from mistreating dogs. You may pay a cheaper price for a pup from a backyard breeder, but you will not have solid information about the health and temperament. In most cases, these people do not know anything about the genetics of their breeding pair or how to produce a healthy puppy. They just decided to let their dog have a litter of pups for fun and/or money. The cheaper price is not worth the gamble you are being asked to take. A puppy from an ethical, reputable breeder will normally cost more. However, your are not just paying for a puppy: you are paying for years of accumulated information, education and experience. 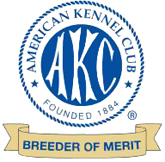 The reputable breeder has put time, knowledge and dollars into a well-planned, thoroughly researched breeding program. They are looking at the latest scientific data in an effort to produce the healthiest, happiest puppy possible, in order to offer you more years of loving companionship. Responsible breeders will provide each buyer with a written genetic health guarantee - not a 3 to 90 day guarantee. They will want to know about you and your family in order to match you with the pup that is best suited to your lifestyle and your home environment. These breeders are educated professionals who are concerned about keeping the breed as healthy as possible for the next generations. With a deep love of the breed, in general, and their dogs, in particular, they will offer references, including giving you their vet's name and phone number. In addition, they will be there for you should any unforeseen problems arise, or to answer questions, share new knowledge and provide advice for years to come. You get what you pay for. When the purchase price is too cheap, it may mean large vet bills and an ill puppy, or a temperament problem, down the road ahead. If you cannot afford to purchase a puppy or an older dog from a reputable breeder, please adopt from your local Humane Society, rather than from a puppy mill, pet store or backyard breeder. All puppies from Ash's Mystical Poodles come with a current health certificate, record of shots from a licensed veterinarian, Home Again micro-chip, four generation pedigree and a written guarantee of replacement for genetic health conditions. Our high ethical standards require all puppies being placed into pet homes will be spayed or neutered. If you would like to own and care for one Ash's Mystical Poodles, you must complete the application that appears when you click here.